When James VI and I claimed his southern kingdom, he brought with him an annual celebration of his deliverance from an alleged plot by the earl of Gowrie, John Ruthven, and his brother Alexander on 5 August 1600. By James’s own account, Alexander Ruthven had accosted him while he was out hunting with a story about a man finding a large pot of gold. Falling for this ruse because he thought it might indicate Spanish Catholic gold flowing into the country in preparation for a rebellion, James had been lured to Ruthven House, where his retainers rescued him from a murderous attack, killing both brothers in the process. The occasion was a difficult one for James’s preachers, since the story seemed far-fetched, and James was the only surviving witness to the most crucial events. In Scotland, preachers such as Robert Bruce openly contested the story. In England, legend has it that Lancelot Andrewes, who preached regularly at court on the 5 August anniversary, begged James on his knees to tell him the truth of the affair. While James steadfastly insisted on his version of events, some suspected that there had been no plot against the king and that the story had been fabricated to cover up the accidental but convenient deaths of two troublesome subjects. The relatively few Gowrie sermons available in print were preached mainly at court and at Paul’s Cross, and are generally by prominent preachers. Manuscript sermons provide an opportunity to expand our understanding of how other preachers approached their task. One of these preachers was James Cleland, a relative newcomer to the pulpit, who preached at Canterbury Cathedral on 5 August 1616. Little is known of Cleland’s early life, but his initial ambitions appear to have been courtly rather than ecclesiastical. He received his MA from Edinburgh University, and may have come to England in hopes of advancement in 1603. In 1607, he published a how-to guide for young noblemen (Hero-paideia, or The institution of a young noble man) which was apparently popular enough to be reprinted, with variant titles, in 1611 and 1612. He was ordained on 18 June 1614, by John King in the parish church of Fulham, Middlesex, at the somewhat advanced age of 37, at which point he seems to have redirected rather than cast aside his ambitions. 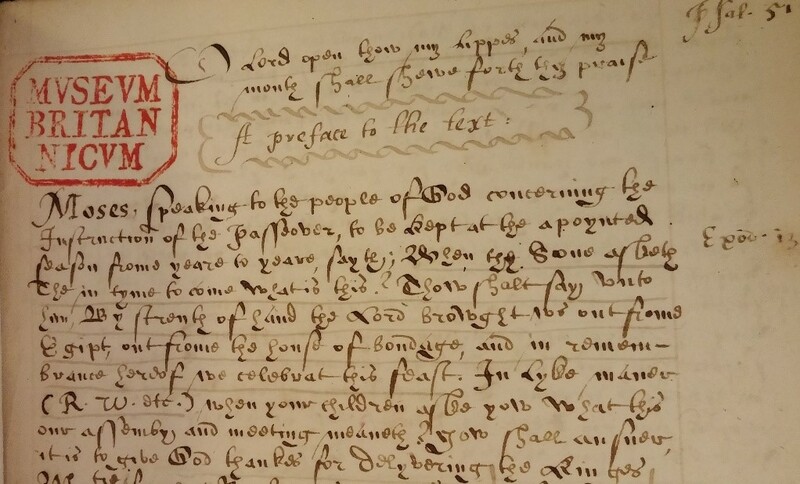 Cleland’s sermon (British Library Royal MS 17 B XIX) follows many of the conventions found in printed Gowrie sermons, such as hinting that Gowrie was motivated by Catholic sympathies, and insisting upon James’s deliverance as a sign of God’s special favour and protection. Unlike most preachers, however, Cleland directly confronts sceptics who question James’s account of the event. He argues that James acted reasonably in going to see the gold, and observes that even Adam and Eve were tricked by dissimulation. In a riskier move, he insists upon the providential nature of the king’s deliverance by drawing attention to the least credible aspects of the story, asking rhetorically whether it was not “strange” that Alexander Ruthven lost courage to strike the fatal blow, whether it was not “wonderfull” that the king managed to get to a window to call for help at the exact moment that his followers were directly below, and whether it was not “most strange, and wonderfull of all” that the young Viscount Haddington should find a shortcut to the tower room and manage to kill both would-be assassins (f. 11v). However, his strongest argument for the king’s veracity is to remind his audience of a curious sequel to the Gowrie incident, and one that had offered a starring role to George Abbot, then Dean of Winchester, and the future source of Cleland’s preferment. Figure 1: The opening of Cleland's sermon. © The British Library. Royal MS.17 B XIX, f. 1r. One of the troubles with the Gowrie narrative was that James had no one to corroborate his story, since the Ruthvens appeared to have acted alone. But in 1608, a full eight years after the incident, authorities claimed they had discovered an accessory to the plot. This was George Sprot of Eyemouth, Berwickshire, a dodgy notary with a habit of forgery, who, under the influence of alcohol, claimed he had known of the plot before it occurred. When questioned, he told the privy council that he had seen a series of letters that Robert Logan, seventh laird of Restalrig, who had died two years earlier, had supposedly exchanged with John Ruthven and others. Under torture, he recanted this story, insisting he had forged the letters. 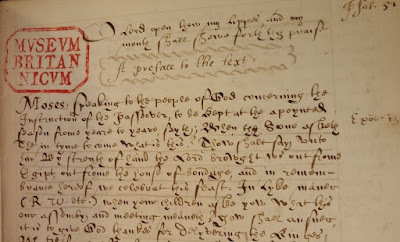 George Home, earl of Dunbar, who stood to gain financially from the ruin of Logan’s estate, allegedly persuaded Sprot to revise his story once again, and at his execution, Sprot claimed that the letter addressed to Ruthven was copied from an original, while he had written the others. The evidence against Sprot was hardly damning, given his reputation and the circumspection of the letter, which offered a safe location for settling a “plot” that might lead to forfeiture of his estates and execution but did not specifically refer to harming the king. For James, however, the case promised an opportunity to validate his narrative. 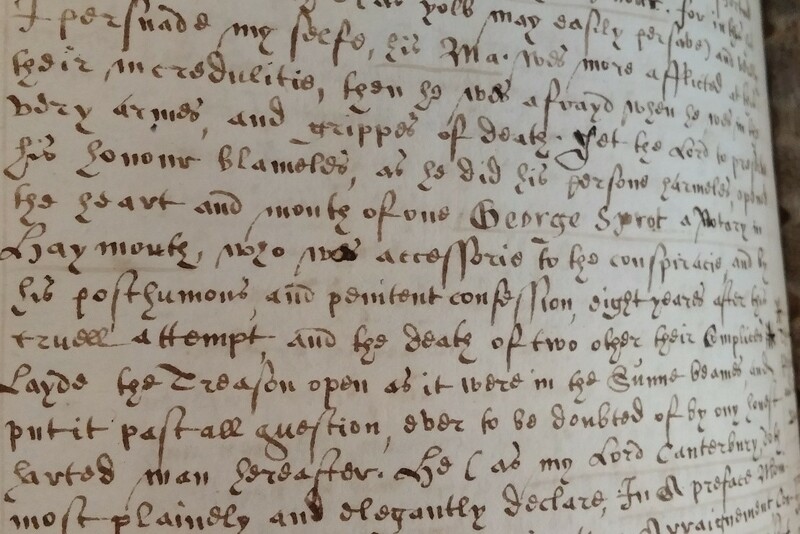 The king despatched Abbot to Scotland to witness Sprot’s trial and execution, after which Abbot contributed a preface to Sir William Hart’s account of the evidence against Sprot (The Examinations, Arraignement and Conviction of George Sprot, 1608, rpt. 1609). The preface focuses not on Sprot’s trial, but only on his execution, suggesting that Abbot’s role was to witness that justice had been done. However, the publication of the pamphlet clearly demonstrates that he had a more important goal: to bring recalcitrant ministers into line. He concludes by warning preachers “that in cases of highest nature between a King and his rebell they conceiue not things to the worst, and (because they will be opposite to him whom most of all they should honor) by buzzings and whisperings, and secret suggestions, without all ground of trueth, labour to sow sedition in the eares of women and children, or in the mindes of men either weake or ill disposed. For as the lips of the Priest should alwayes preserue knowledge, so should they preserue trueth. And we are to go before our flocks and Congregations in obedience and obsequiousnesse vnto the Christian Magistrate, not in sowing sedition, or making of mutinies, to the disturbance of the State” (37). Curiously, when James appointed Abbot archbishop of Canterbury in 1611, he claimed to be honouring a request made by the recently deceased earl of Dunbar, the man who had profited from Logan’s fall. Figure 2: Reference to George Sprot in Cleland's sermon. © The British Library. Royal MS.17 B XIX. f. 12v. Cleland clearly seems to have been rewarded for defending the king and citing the Sprot episode. Abbot appointed him rector at Chartham, Kent, two years later in October 1618, by which time he had also been granted the degree Doctor of Divinity. That same year, Cleland became domestic chaplain to Lodovick Stuart, second duke of Lenox and Richmond, for whom he published a flattering funeral sermon in 1624. Abbot’s hand can be traced here too: in 1616, the archbishop had absolved the duke of his Scottish excommunication, the penalty for suspected Catholic sympathies. Cleland in turn rewarded Abbot in 1626, publishing an effusive sermon that he had preached, once again at Canterbury Cathedral, praising Abbot for supplying a conduit to provide water to the city, and in the process comparing him to Jacob (Iacobs wel, and Abbots conduit, paralleled, preached, and applied, 1626). 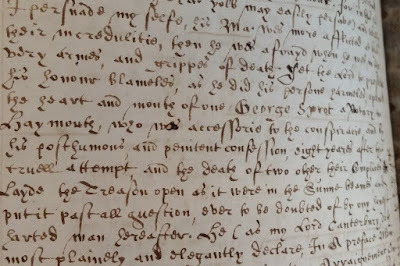 There is a curious gap of at least two years between the preaching of the Gowrie sermon and the copying of the manuscript, which includes a marginal reference to a document of 1618. Perhaps Cleland hoped to bolster his resume with a command to publish. If so, he was apparently disappointed. Possibly his defence of James’s story had been too heavy-handed, and more likely to increase scepticism than to put it to rest. Nevertheless, the preservation of this manuscript sermon leads us into a web almost as tangled as that of the Gowrie conspiracy itself. The above images are used with the kind permission of The British Library. John Hacket, A Century of Sermons Upon Several Remarkable Subjects (1675), viii. Information about Cleland’s clerical career is taken from the Clergy of the Church of England Database (CCEd Person ID 39547) http://theclergydatabase.org.uk/ as well as from the title pages of his sermons. John Simmons, “Sprot , George (d. 1608),” Oxford Dictionary of National Biography, online edn., Oxford: OUP, 2004. http://www.oxforddnb.com.libproxy.uregina.ca:2048/view/article/26182 (accessed July 12, 2016). Kenneth Fincham, “Abbot, George (1562–1633),” Oxford Dictionary of National Biography, Oxford: OUP, 2004; online edn. January 2011, http://www.oxforddnb.com.libproxy.uregina.ca:2048/view/article/4 (accessed July 12, 2016).